We’ve got some big changes coming to DemandQuest but we know how people value our digital marketing classes so we’re offering one special session this spring with all of our most popular classes! Join us for Google Tag Manager, Google Data Studio, Social Media Advertising, SEO, Google Ad(Word)s, and Google Analytics. Out instructors have been doing a ton of custom training and have booked out most of 2019 so this will likely be our only session of public classes for 2019. If you’ve thought about refreshing your digital marketing skills, spring 2019 is the time to do it! We’ve been teaching in Minneapolis since 2011 and pride ourselves on having hands-on instruction from industry experts. We don’t rent out conference rooms in hotels to we can teach surface level digital marketing, we dig deep so that you leave with actual knowledge you can apply to your digital marketing strategy immediately. We hope to see you this spring! If custom training is a better fit for you and your company, you can find out more here: Executive Training. It’s been a busy summer and we’re looking forward to getting back to school. There are so many changes to advertising on social media, reporting in Analytics and Google Data Studio, Google even changed AdWords to Google Ads. Below are some ways we’re trying to keep up. We’re also offering new classes this fall including Google Data Studio with Jeff Sauer and my (I Hate the) new Google Ads (AdWords) Interface. You can save 10% with promo code ‘falldigital’. See all our fall digital marketing classes here. To get ready for the holiday shopping season, we’re hosting a free seminar with Google to help you Drive a Holiday Shopping Rush for your Business. The holiday season will be here before we know it. 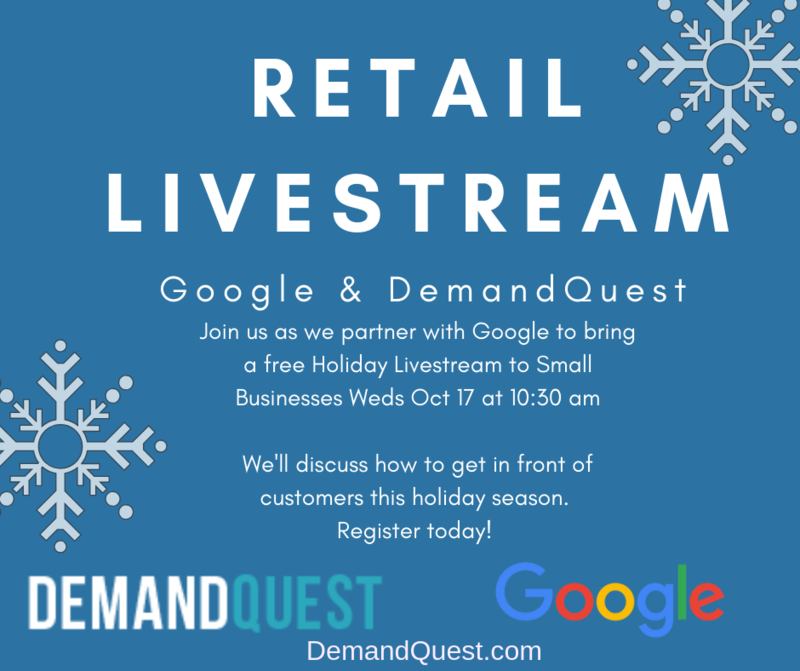 Join us at the DemandQuest Marketing Institute to tune into the Google Livestream where we will show you how to get in front of customers in your area. The Holiday Livestream is on Wednesday, Oct 17th from 10:30-12:30 pm. Register now. We’ve been teaching digital marketing for over 10 years and we’re excited to be teaming up with Google to bring a short morning session of great digital marketing insights, free for local businesses. Bring a laptop to work during class or just bring a notebook for notes. We’ll send out resources via email after class. This class will sell out so we will only be able to offer space for up to 4 team members per company/email address. Light refreshments will also be provided.